The Eppendorf Top Buret sets standards for manual titration. With each turn of the dial, liquid is continously dispensed. 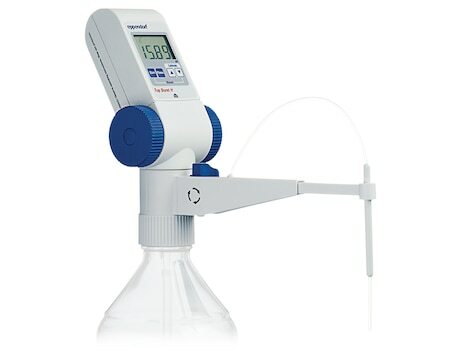 This eliminates the need for new liquid aspiration and makes titration simpler and safer. The Top Buret comes in two different models: Model M features a dispensing rate of 2,500 µL per rotation; Model H features a rate of 5,000 µL per rotation. The digital display readings on both models range from 10 µL to 999.9 mL with the size of your supply bottle being the only limiting factor. It’s clearly labeled user-friendly digital display and simple knob control provides for easy, ergonomic and fatigue free operation.